Hello all! Boo here from People with Pets. Today we are going to talk about a very serious subject to both people and pets…FOOD! We all LOVE to eat but did you know there are a surprising number of foods that are NOT healthy or even SAFE for your pets? Today we explore some yummy things that humans may enjoy that could pet-tentially harm your furry friends. Avocados – While it may make a tasty treat in Guacamole, pets should never be fed Avocados. A chemical contained in them called, Persin, can cause vomiting and diarrhea in pets. These should be avoided for our sake and your carpet. Asparagus – Truthfully it would only be beneficial in its raw form. Cooking it removes the nutrients that would be good for your pet but feeding it to them raw is not advised. Grapes/Raisins – While they are a tasty treat for you, they should be avoided at all costs for dogs. They are very dangerous to us! They may seem tasty at first but can lead to kidney failure. Mushrooms, Onions, Chives & Garlic – While these may be great incorporated into your pasta dishes, you should avoid feeding these to your pets. Coconut & Coconut Oil – While it may not be instantly toxic, this can cause diarrhea and vomiting and long terms effects on your pet are not good. Coconut water, in particular, has an extremely high level of potassium which is dangerous to pets. Citrus – The skins, peels, and seeds of all citrus should be avoided totally. The fleshy fruits can be consumed in small quantities. Cherries – Skins, pits, and the plants themselves all contain cyanide. This is poisonous to pets. Tomatoes – Avoid tomatoes. The red fruit may not cause any issues, but definitely, in their GREEN form, should be avoided. Apples – Make a great treat provided you remove the core and seeds. They are high in vitamins and low in fat. Bananas – Are okay, as long as, they are given sparingly. They should only be given as a TREAT and not a regular occurrence because they contain a lot of sugar. Watermelon – You know from the name that watermelon is mostly water. 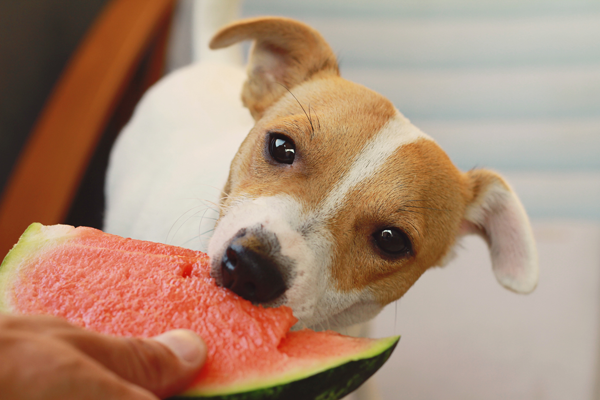 Feeding this to your pets on a hot day can help keep them hydrated. Be sure to pick out all the seeds first! Celery, Cucumbers and Potatoes – All go on the “nice list” for pets. As with most items the “skins” themselves should be avoided on most items as they can clog the digestive tract and be extra hard for pets to process. Pears/ Peaches – Removing the pits and seeds, and cutting into bite size chunks make these safe for pets. Both of these are high in vitamin content and are tasty too! Sweet Potatoes – Washed, dried and peeled, sweet potatoes can provide an excellent source of multiple vitamins, fiber and beta carotene. It is hypoallergenic and even pets with sensitive GI systems and allergies are able to consume sweet potatoes regularly. This is why you find many foods for pets made with Sweet Potato. Most nuts should be avoided. Macadamia nuts in particular are harmful to pets. They can cause dizziness, weakness, seizures, depression or worse. Pecans, walnuts, almonds and peanuts are also bad for pets. They contain high amounts of fat and protein and it is hard for their systems to break down. Meat Fat & Bones – Many of our humans mean well but they like to feed us, leftovers. Which is really garbage that they wouldn’t feed themselves! So why give it to your pets?! DON’T! Bones especially chicken, turkey or other birds, can shatter easily causing injury to a pet’s insides. Pets may enjoy chewing and it is healthy for them to have bones such as pork and steak IF, you have cleaned and ensured that it is a large bone, without slivers and you are able to supervise your pet while enjoying. Raw Meats, Fish & Proteins – Such as sushi, eggs and hamburger are all BAD for your pet. They can contain parasites that will infect your pet and cause them GI distress. It’s true, many of us love to ride in the car. We love feeling the wind in our ears and hitting that drive thru with you, but feeding processed and high fat foods like cheeseburgers, french fries, chicken nuggets, ice cream and more, are very bad for us. Try your best not to sneak us these treats. Sugary Foods and Yeast Dough – Foods like cakes, cookies, and donuts are all VERY bad for us furry friends. Overproduction of yeast in the body can cause excessive gas and yeast infections that lead to itchy flaky skin, and more serious GI issues. These should be avoided. There are tons of great recipes here if you want to make a Pet Friendly birthday cake. Chocolate, Caffeine & Coffee – Each of these items contains a substance called, methylxanthines, which can cause vomiting and diarrhea at best or seizures, abnormal heart rhythms and death at worst. Be sure to keep these away from your pets 100% of the time! Alcohol – I know we have all seen the videos on Youtube with drunk dogs stumbling around. This is called abuse. It is not funny and should be avoided at all costs! Pets should NOT consume alcohol even in small amounts! Salt and Salty Snacks – Food like chips, pretzels, and popcorn contain high amounts of sodium that can lead to excessive thirst and urination as well as poisoning. Signs of poisoning include, diarrhea, vomiting, fever, seizures and can even cause your pet to stop breathing. Not all human foods are bad for pets, but you should remember that we digest differently than you. Feeding us the wrong treats can encourage us to build unhealthy eating habits. If you choose to feed us human food, remember to keep in mind the size of your pet’s stomach and don’t OVERFEED. 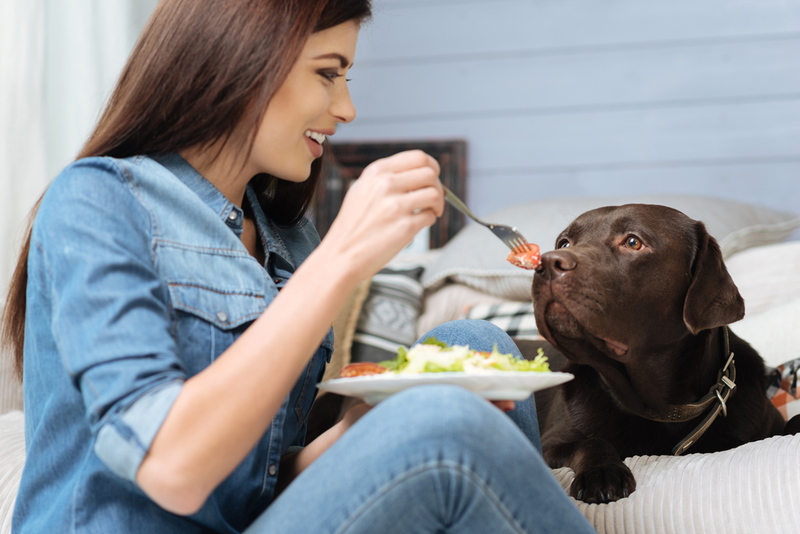 Us pets are mostly carnivores and don’t really have much need for fruits and vegetables in our diet, especially if we are eating a well-balanced pet food, but the occasional treat can be okay! If your furry friend manages his or her way into a stash of something that is potentially dangerous, always have the information for the ASPCA Animal Poison Control Center handy, call (888) 426-4435.